As per custom, the television channel airing the Super Bowl is also airing an interview with the President of the United States just before kickoff. That interview with Donald Trump has already been conducted, and Fox has already begun leaking a portion of it. Even though the interview is conducted by conservative Bill O’Reilly, it appears to be combative. And in one leaked portion, Trump specifically defends Russian dictator Vladimir Putin for being a murderer. Is Trump is a Russian spy? To be clear, Vladimir Putin is primarily accused of murdering the journalists who report negative things about him, and murdering the political opponents who dare to run against him. 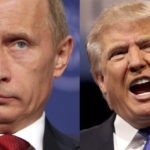 Putin also recently appears to have murdered two U.S. intel assets is Russia, and just yesterday Putin appears to have poisoned his leading political opponent for the second time in three years. And yet Donald Trump is directly defending Putin’s status as a murderer. The rest of the interview has not yet been released by Fox. But considering that the network is already airing Donald Trump’s defense of Putin for being a murderer, it’s enough to wonder what kind of bombshells they’re holding back for Sunday’s full airing. For those who have the stomach to watch the full interview between Trump and Bill O’Reilly, it will air on Sunday on Fox Network (not Fox News) at around 4pm eastern time. In the mean time, you can watch Trump’s impeachable pro-murder comment below.